The northern cardinal (Carinalis cardinalis) can be found in eastern and central North American continent from the Great Lakes as far south as Central America. Not all northern cardinals are equally showy though – only males have the bright red plumage. 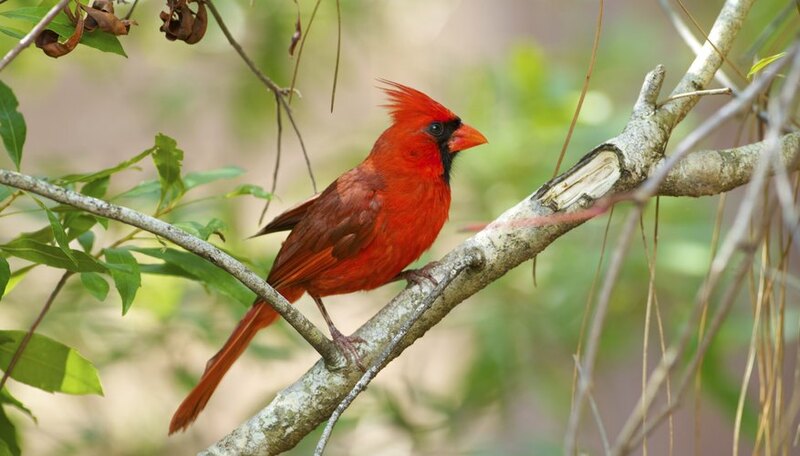 That's also true for the vermillion cardinal (Cardinalis phoeniceus), which lives in Venezuela and Columbia. The male desert cardinal (Cardinalis sinuatus), found in the deserts of the southern U.S. and Mexico, isn't bright red, but it still has more distinct coloration than the female. The bright plumage of the male is responsible for the northern cardinal's nickname: the redbird. Besides the bright red plumage, males have a black mask on their faces. Females lack the mask, and their brown or greenish-brown plumage is less distinctive. Both males and females have thick orange bills, but those of the male tend to have some black coloration. Both males and females have triangular crests, and the male is about an inch (2 centimeters) larger than the female. All juvenile cardinals lack the distinctive red plumage and look more like females than males. Anyone impressed by the plumage of the male northern cardinal will be floored by that of the male vermillion cardinal. Also known as the Venezuela cardinal, this rosy red bird is a little more than an inch smaller than the northern cardinal, and it sports a spike-like crest that extends straight up. Males of the species perch in in the early morning and attract attention with their loud whistles. Females are seldom as visible. Their markings, like those of female northern cardinals, are more muted, and they tend to stay in their nests. The desert cardinal is related to the northern cardinal, and although their habitats overlap somewhat, the desert bird – also known by the name Pyrrhuloxia – prefers the arid regions of the southwest and northern Mexico. The difference in plumage between males and females is not as pronounced as that between males and females of the northern species. Males do have more red markings than females, however, especially around the beak. Females tend to be grayish or grayish-brown. Juveniles look like females. The red-crested cardinal (Paroaria coronata), red-cowled cardinal (Paroraria dominicana) and masked cardinal (Paroaria nigrogenis) do not belong to the family Cardinalidae but are still popularly referred to as cardinals. The red-crested cardinal is native to southern Brazil, Bolivia, Paraguay, Uruguay and northern Argentina and has been introduced to Hawaii and Puerto Rico. The red-cowled cardinal lives in northeast Brazil, and the masked cardinal lives in Venezuela, Colombia and Trinidad. All have striking red coloration on the heads, and the females of all three species are virtually indistinguishable from the males. Cardinal species are generally noted for their whistle-like chirping. The song of the northern cardinal sounds a bit like the bird is repeating the word "cheer." The birds usually mate for life and are often seen in pairs, so if you see a female bird, keep an eye out for the male, because it probably isn't far away. You'll probably spot the male first, though, because females are more likely to be nesting. Cardinals brood twice a year, and nest building and maintenance are the female's jobs. While the female is nesting, the male forages and brings food back to the nest. 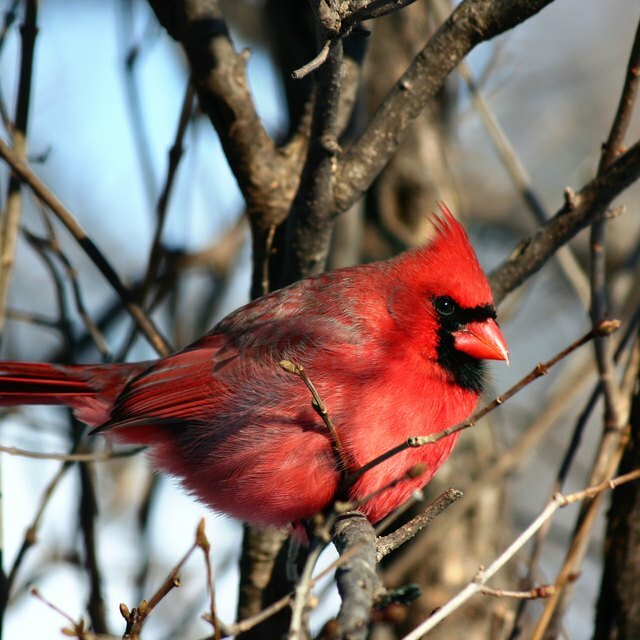 Northern cardinals don't migrate, so you're as likely to see one in winter as in summer. The red plumage of the male is especially striking when seen against a backdrop of snowy branches. Deziel, Chris. "How to Tell if a Cardinal Bird Is Male or Female." Sciencing, https://sciencing.com/tell-cardinal-bird-male-female-5750222.html. 13 March 2018.